Homelessness is a very evident, and very visible problem in the United States. It is not unusual to pass by a homeless man sitting on the side of the street on your way to work, or to see a whole crowd of sleeping men while running through the park. The hard truth is that after a while, the homelessness that surrounds you becomes routine. It stings every time you pass somebody by, but the image is soon forgotten in the course of everyday life. At least that goes for most people. However, Villanova history professor Stephanie Sena isn’t just anybody.Just a year ago, an NPR report caught Sena’s attention, and never let go. It was about the Harvard Square Homeless Shelter, which was profiled in the 2010 book Shelter: Where Harvard Meets Homeless. The shelter first opened its doors in 1983, and had been serving twenty men and women every night between the months of November and April ever since at the Lutheran Church in Harvard Square. The goal of the shelter was to provide the homeless men and women with a temporary place to stay, one that encouraged an atmosphere of dignity and respect as they made the transition to permanent housing. Sena is a professor known for her passion and enthusiasm among the Villanova community, and she was determined to start a similar project in Philadelphia. She began contacting churches, lawyers, and all those in charge of the Harvard shelter for advice and support. Then, she turned to her students. Sena expected a few to show up for the first meeting last spring. What she didn’t expect what the room to be jam-packed, standing room only. Less than a year after hearing the initial NPR Report, the Student-Run Emergency Housing Unit of Philadelphia (SREHUP) was up and running. The shelter has just completed its first winter season, and is already planning for the next. Similar to the Harvard Square Homeless Shelter, SREHUP is focused on instilling a sense of dignity and respect in their guests. However, unlike Harvard’s Shelter which runs on a two-week lottery basis (beds are offered for two weeks at a time through a lottery system), the same 30 guests are guaranteed the security of a safe place to stay for the entire winter. 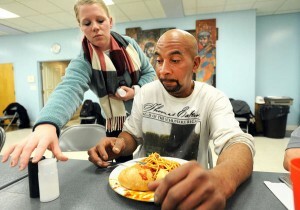 This provides them with the needed stability to look for permanent housing and a stable job. If nothing else, Sena wants to emphasize one central point- “It’s not a band-aid, and it’s not a destination”. And to some degree, I agree. SREHUP works as emergency housing shelter at night, while concentrating on employment and housing opportunities for its guests during the day. The ultimate goal is for all residents to achieve permanent housing and stable employment in the immediate future. Therefore, their stay is supplemented with a variety of holistic programs including job training, SAT prep, tutoring, and computer literacy. Programs ranging from art and yoga lessons to money management classes are also run at the facility. In addition, students learn to advocate for legislation in issues concerning homelessness such as education reform, job creation, and fair housing initiatives. Some have already taken to Washinton D.C. And as the shelter is almost 100% student run, the main emphasis is on student education concerning the issues of homelessness and homelessness prevention. With any social change, information gathering is a necessary first step. Education is next. With a board of 20 directors, and over 300 Philadelphia area college students from schools such as Villanova, Temple, Swarthmore, Penn, and Drexel involved in SREHUP, the message is spreading. Students are involved in all aspects of running the shelter- from fundraising, to media relations, to volunteer recruitment. The success of the first season is a testament to the student’s personal commitment to the cause. It’s safe to say that SREHUP is not a band-aid for those living in the shelter. Not if the shelter truly provides their guests with the opportunity to receive permanent housing and employment in the future. However, it is yet another band-aid, an ever so small band-aid on the vast problem of homelessness, which is bursting at its seams. Will SREHUP make a difference in the lives of 30 men, every single winter season? Undoubtedly. However, the stinging reality is that 30 more men will be lined up in the next winter season. What do you think would be a way to increase the impact of SREHUP and similar programs? What additional collaborative or collective efforts might assist in truly solving the issue of homelessness?